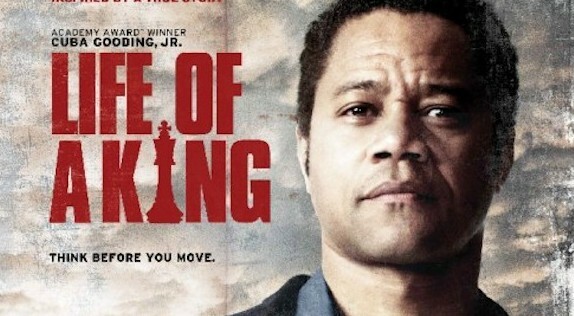 *In “Life of a King,” Eugene Brown (Cuba Gooding, Jr.) was so worried about returning to his neighborhood in inner-city Washington, DC after serving 17 years for bank robbery that he shared his concern with his cellmate Searcy (Dennis Haysbert). He also handed Eugene a chess piece, hoping it might serve as a constant reminder to avoid trouble by employing fundamental game strategy. And that practical piece of advice would come in handy, especially since landing employment would turn out to be quite a challenge, given his criminal record. But rather than break the law again for a quick buck, Eugene displayed the patience to wait until he found a legit job as a janitor. Working at the same high school his children had attended, he was afforded an opportunity to redeem himself when asked by the principal (LisaGay Hamilton) to monitor detention, too. Instead of just having the students stand at the blackboard and write, “I will not be late for class” or “I will not forget my homework” 50 times, Eugene came up with the inspired idea of teaching them how to play chess each afternoon. Soon, he founded a chess club as a regular afterschool activity and viable alternative to the gangsta ways so many of the troubled youth found attractive. Meanwhile, Eugene needed to mend fences with his estranged offspring, college coed Katrina (Rachae Thomas), and black sheep Marcus (Jordan Calloway), a juvenile jailbird following in his father’s footsteps. That proves easier said than done since the absentee-dad wasn’t around for either’s formative years. Written and directed by Jake Goldberger (Don McKay), Life of a King is a warts-and-all biopic based on the downfall and resurrection of the real Eugene Brown. As raw and realistic as it is predictable and cliché-ridden, this modern morality play does at least drive home a pertinent message for adolescents in the targeted demographic. A Sunday school-style parable which makes very effective use of chess mastery as a metaphor for negotiating the perilous gauntlet of possible ghetto pitfalls.